Solomon Thomas is a defensive lineman for the San Francisco 49ers. He joined the National Football League (NFL) in 2017 and is working to establish himself as one of the best pass rushers in the league. Thomas’ journey to the NFL is an interesting one. Rather than football, he grew up surfing and playing soccer in far away Australia. Get to know more about his story here, including his career, parents and the tragic loss of his sister. Solomon Christopher Thomas was born on the 26th of August 1995 in Chicago, Illinois. At the age of two, his dad (who was an international sales manager at Procter & Gamble) was transferred to Australia. Thomas spent the next five years of his life there, indulging in surfing and playing on the beach. The family stayed in Australia until when he was eight when his dad was transferred back to the states. On coming back to America, they settled in Connecticut for a few years before moving to Texas, which was where Thomas fell in love with football. Solomon Thomas had his high school education at Coppell High School, Texas where he played both football and basketball. He totaled 272 tackles and 21 sacks in high school and was named a second-team all-state as well as Second-Team All-USA by USA Today in his senior year. 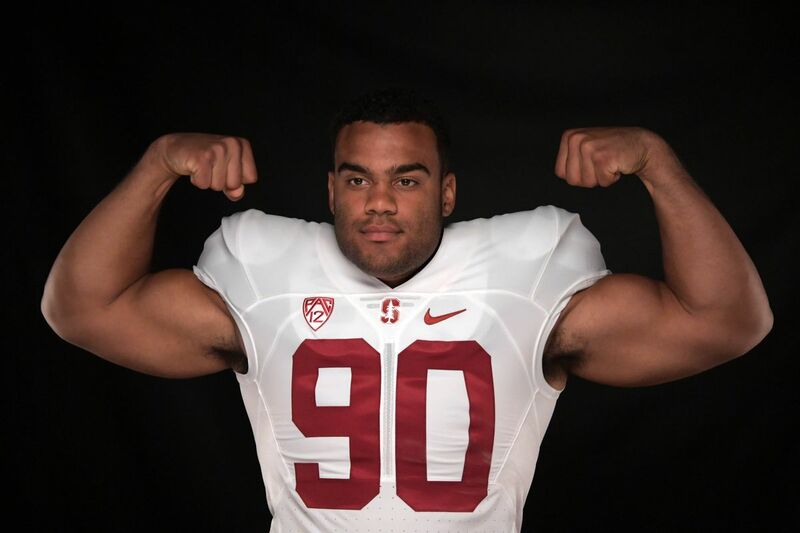 For his college education, Solomon Thomas picked the prestigious Stanford University where he majored in communications. He was redshirted in his freshman year – 2014. In his sophomore year – 2015, the pass rusher appeared in all 14 games and recorded 39 tackles, 3.5 sacks, 10.5 TFLs, and 2 fumble recoveries. Thomas did even better in the next season. In 13 games, he tallied 62 tackles, 8.0 sacks, 15 TFLs, and 2 fumble recoveries. He was subsequently named a Second-Team All-America (USA Today) and a Third-Team All-America (Associated Press). He also received First-Team All-Pac-12 honors and won the prestigious Morris Trophy as the best defensive lineman in the Pac-12 conference. Solomon Thomas decided to strike while the iron was still hot and declared for the 2017 NFL draft. Solomon Thomas was highly rated going into the draft as NFLDraftScout.com, ESPN, and Sports Illustrated ranked him the second-best defensive end in the draft while Pro Football Focus ranked him as the fourth best defensive end. Thomas lived up to his high billing and was the 3rd overall pick in the 2017 NFL draft. He was picked by the San Francisco 49ers who signed him to a handsome four-year contract worth $28.14 million. In his debut season, Solomon Thomas appeared in 14 games (12 starts) and recorded 41 tackles and three sacks. His first career sack came in week four of the 2017 season, his ‘victim’ was Arizona Cardinals quarterback Carson Palmer. 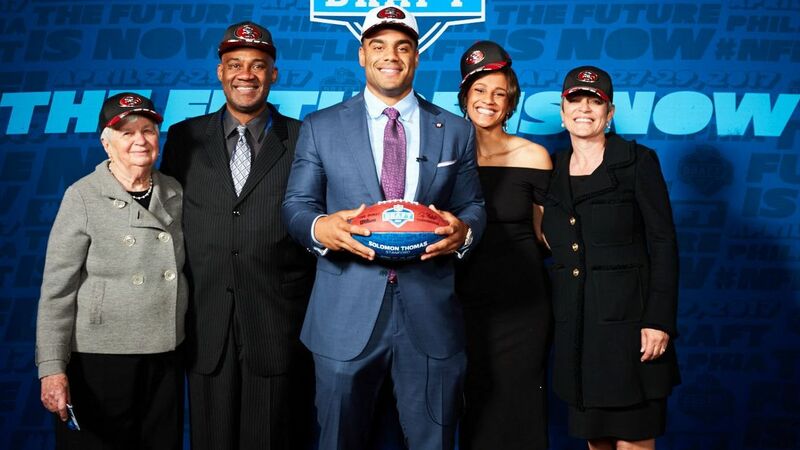 Solomon Thomas comes from a family of four that includes dad, Chris Thomas, mom, Martha and sister, Ella (now late). His parents are athletically gifted, his dad played college basketball while his mom ran track. His parents met while attending Wooster College in Ohio. Thomas’ elder sister and only sibling, Ella Elizabeth Thomas sadly took her life on the 23rd of January 2018. She died of a self-inflicted gunshot at a friend’s apartment. She had been suffering from depression, anxiety and PTSD, partly caused by a sexual assault she suffered while in her sophomore in college. She was also suffering from feelings of inadequacy. The loss devastated Thomas and his family as he was very close to her. According to him, she had a heart of gold and loved everybody. The family was aware of her mental health issues and she was getting help for it, but sadly it was not enough. In the wake of her death, the Thomas family made a conscious decision not to hide it but to talk about it so as to raise awareness about suicide and mental health. Thomas, his parents and eight of Ella’s friends also took part in a 16-mile walk in Dallas to raise money for the American Foundation for Suicide Prevention. As a team, they raised $39, 000, (with the 49ers donating $5,000). Thomas also received overwhelming support from his team, some of whom attended his sister’s funeral. Following his sister’s death, the family donated her car to a youth charity and her college fund to a local college student. They hope that her death won’t be in vain but would assist others in getting help. Solomon Thomas is 6 feet 3 inches tall OR 1.90m and weighs an intimidating 280lbs or 127 pounds. He has an arm length of 33 inches and a hand size of 9 7⁄8 inches. His well-built frame is enough to strike fear into the heart of an unsuspecting opponent. Thomas is also very athletic, fluid and quick for a player of his size.